An image of Pikachu with what is clearly the Pokemon X version mascot, Xerneas, appeared on the Smash Bros. website. There seems to be somewhat of a pattern with how Smash Bros. director Masahiro Sakurai is revealing returning fighters for Super Smash Bros. For Wii U and 3DS. Captain Olimar was announced in the lead up to Pikmin 3's release, Toon Link was announced just after Wind Waker HD's release, and Sonic was revealed in the lead-up to the release of Sonic Lost World. So, naturally, given that the fate of three Pokemon characters from Brawl (Lucario, Jigglypuff, and Pokemon Trainer) is still unknown, Pokemon fans have been keeping a keen eye on the official Smash Bros. website, in the days leading up to, and following the launch of Pokemon X and Y. 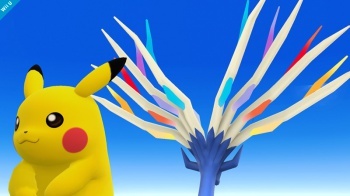 Now, that cheeky bugger Sakurai has simply posted up a single image, which shows Pikachu whith what is very clearly Xerneas, the Pokemon X version mascot. It was accompanied by the following caption on the Miiverse. "Pic of the day. We have absolutely nothing to announce today regarding PokÃ©mon X and PokÃ©mon Y. Really!" While assuming that this means Xerneas will be a playable character is a bit of a strectch, in Super Smash Bros. Brawl, the Pokemon Diamond and Pearl version mascots, Dialga and Palkia, appeared as assist characters from the Pokeball item (as did a whole host of other Pokemon).